Tappoo is remodelling its 150sq m arrivals store, at the Nadi International Airport where around 95 per cent of the business is liquor tobacco confectionery. TRBusiness can confirm that the initial plan was to open the revamped store in the first week of December, but it was delayed. Kaushal Tappoo, Executive Director, Tappoo, told TRBusiness: “The remodelling of the arrivals store is still happening. “We hope it will increase our liquor business by 15 per cent. “The fit-out is being undertaken by Kingsmen, who will ensure it looks like a really fantastic and inviting store. Last year, Fiji registered the highest number of visitor arrivals since 2008 with number reaching 842,884. This represents an increase of 6.4 per cent on the previous year (Source: Fiji Bureau of Statistic). With numbers continuing to look positive in 2018 — visitor arrivals in June, for example, rose 6.6 per cent year-on-year to 81, 653 per cent it is easy to see why Tappoo is in optimistic mood. “Things are going well and business in Fiji is pretty good,” Tappoo remarked: “Tourism numbers are good and there is healthy growth so far. He added: “The good thing is that we grew last year and have pretty much been growing every year. Speaking ahead of the general election in the country which took place on November 14, Tappoo was also hoping the existing government would remain in place. This turned out to be the case with Prime Minister Frank Bainimarama’s party winning. He commented: “The current government is very pro-business and has a ‘how can we help’ attitude which is great. Meanwhile, Tappoo Duty Free which holds a 14-year arrivals and departures concession at Nadi International Airport, is refusing to rule out overseas expansion. “We are definitely going to keep our eyes and ears open in terms of what is coming up in our part of the world, in Australia and New Zealand specifically. Speaking of Australia and New Zealand, Tappoo says the company does not focus too much on DF&TR operations in these countries or the region in general. One thing it is focused on is offering a comprehensive selection of local products alongside its top-selling liquor and tobacco and beauty items. He explained: “Fiji produces artefacts and local crafts and also has a local vodka called Fiji Coconut. “This is a great sell because when consumers look at the bottle they realise they won’t find it anywhere else. Promotions themselves are a key part of the retailer’s strategy, with a particular emphasis on liquor and confectionery. “Promotions are very important to us,” he acknowledged. “They are mostly around liquor and confectionery which work really well. Looking ahead to 2019, Tappoo will maintain the same positive approach which has served it so well in recent years. “We are thinking ahead to next year in the sense we want to continue the growth phase. “We don’t want to come to a situation where we stagnate and look at things when we are flat. “We want to look at things positively and not think of reasons why we shouldn’t grow next year. Let’s work on how we can register double-digit growth in 2019,” he concluded. For many years, Merewai Ravuni’s warm and welcoming voice was the first thing people would hear when they called the Tappoo headquarters in Sigatoka. In 1972, the then 19-year-old from Vusama Village near Natadola started her first job as a receptionist with Tappoo in Sigatoka. Today, some 46 years later Merewai remains with the company, where she now works as a receptionist at its Nadi warehouse. Tappoo Group of Companies recognised long-serving staff members like Merewai at two Staff Appreciations Nights held in Nadi and Suva. 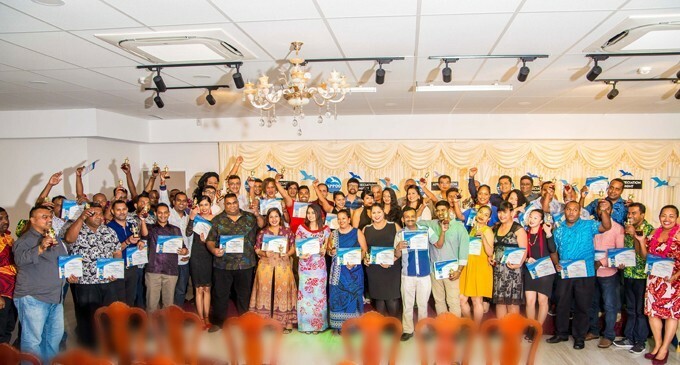 Held annually, this year’s event was attended by some 1500 Tappoo staff where Long Service Awards were handed out to 491 employees in six categories. 53-year-old Sheik Mohammed was also recognised for his 33 years of service with the company. He joined as a 20-year-old in the company’s Sigatoka warehouse in 1985 and today leads sales and distribution of Pepsi beverages and Tip Top ice creams in the Suva – Nausori corridor. Widely regarded as Fiji’s most trusted mark, the Tappoo Group of Companies has grown from a legacy retail brand with over 77 years of history and national presence into one of Fiji’s largest companies with over 1700 employees and diverse business interests spanning a number of sectors. THE Tappoo Group of Companies added another feather in its cap when its duty-free arm was shortlisted for awards at what is dubbed as the “Oscars of the travel-retail industry”. The company was shortlisted for awards in three major categories at the 34th annual Frontier Awards in Cannes last month. The Frontier Awards celebrates the highest achievements in duty free retail across the globe, which is expected to exceed $70 billion in sales in 2018. Tappoo Duty Free was a finalist for Airport Retailer of the Year, Speciality Concept of the Year (for its partnership with Fiji Rugby) and Best Food & Beverage Partnership of the Year (for its Bula Bar & Bistro outlet at Nadi Airport). Tappoo Group Executive Director Kaushal Tappoo said they were “immensely thrilled” and proud to be among the world’s best duty-free retailers. “It’s a huge achievement for a Fijian operator to be nominated alongside some of the world’s best Duty-Free operators from Singapore, India and Dubai to name a few,” he said. In 2016, Tappoo unveiled a new world-class duty-free shopping experience to match the new look Nadi International Airport that was unveiled earlier in June after an upgrade. Fiji Airports executive chairman Faiz Khan said they were proud to partner with the group in its efforts to provide an outstanding arrivals and departures experience for international guests and Fijians alike. Tappoo’s Bula Bar & Bistro at Nadi Airport Departures was nominated for the Frontier Best Food & Beverage Partnership of the Year Award. The Tappoo Group of Companies added another feather in its cap when its Duty-Free arm was shortlisted for awards in three major categories at the 34 annual Frontier Awards in Cannes last month. Widely regarded as the ‘Oscars of the travel-retail industry’, the Frontier Awards celebrates the highest achievements in duty free retail across the globe, which is expected to exceed $70 billion in sales in 2018. In 2016, Tappoo unveiled a new world-class Duty-Free shopping experience to match the new look Nadi International Airport that was unveiled in June after a upgrade. The new Tappoo departures duty free store features a modern walk through design that allows departing travellers to easily navigate their way through state of the art displays from some of the world’s best-selling liquor, confectionary, fragrance, skincare, cosmetics and fashion brands. In addition to MAC Cosmetics and Bobbi Brown (exclusives for the Fiji market), the Nadi airport store now exclusively carries the cult British perfume and candle brand Jo Malone. 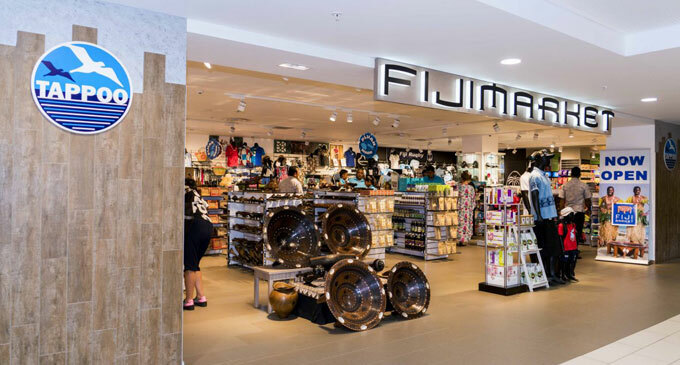 The store also features a variety of Fiji destination merchandise including Fiji Coconut Vodka, locally grown kava and honey, as well as Fiji Rugby merchandise, which was nominated for the Speciality Concept of the Year Award. Awards nominations are a testament to the Tappoo Group’s ongoing commitment to delivering world-class Duty-Free shopping experiences to all travellers”. After exclusively selling Fiji Rugby branded merchandise in stores for close to a decade, Tappoo introduced special branded Fiji Rugby corners in all of its main stores this year, which earned it a nomination for the Frontier Speciality Concept of the Year Award. Tappoo has drawn on its retail experience with bestselling fragrances to develop a line of Fiji Rugby branded perfumes in collaboration with the Fiji Rugby Union. in Tappoo department stores in Sigatoka, Nadi, Lautoka and Suva City. Premium retail and distribution giant Tappoo Group have joined forces with Fiji Rugby Union in a three-year partnership announced today. The deal sees Tappoo become the Exclusive Retailer for the Fiji Rugby Union, Fiji Airways Flying Fijians and Fiji Airways Men’s and Fijiana Sevens until September 2021. In addition to holding the rights to retail FRU merchandise at games and in store, Tappoo will also introduce an exclusive Fiji Rugby Union trophy installation into their department stores in Sigatoka, Nadi, Lautoka and Suva City. The display will exhibit selections of Fiji Rugby Union current and historical Plates, Cups and Trophies won on the international stage including HSBC World Sevens trophies, the Pacific Nations Cup and other such coveted prizes. The trophy display will be the first of its kind for Fiji and an initiative Executive Director of the Tappoo Group Mr. Harnish Tappoo says they are proud to be bringing to rugby fans both local and visiting. “We have always been proud to retail the FRU merchandise in our stores but are really excited to join as an official sponsor and take the relationship to a new level where we help deliver success for rugby in this country.” he said. CEO of the FRU Mr. John O’Connor extended his appreciation to the Tappoo Group in recognizing the value of aligning with Fiji’s national code and teams. “We are pleased to welcome Tappoo into the Fiji Rugby Union family and are grateful to Mr. Harnish Tappoo for his decision to support the game of rugby.” he said. The Tappoo announcement continues a string of new and renewed commercial partnerships between the FRU and some of Fiji’s major corporate organizations. In the recent Fiji Airways Drua National Rugby Championship Tappoo contributed a Fan of the Match series of jersey giveaways as well as the Player of the Match awards for each of the 7 fixture matches and will continue to introduce new initiatives throughout the partnership. “We are passionate about connecting the fans of rugby to the teams that are representing our country and we will to continue to develop ways with the FRU to do that for Fiji.” said Mr. Tappoo. The Tappoo Group has been an established icon in Fiji for 78 years originating as a hand crafted jewellery store in Sigatoka before building to be a giant in Duty Free, resort outlets, distribution centres, hotel management, major department stores, motor vehicle dealerships, Mobil fuel outlets and more. As a tribute to the Chinese community in Fiji, for their invaluable contribu¬tions to our country for many years, the Tappoo Group hosted a special Mid-Au¬tumn Festival celebration event in TappooC¬ity Suva on Wednesday. Mid-Autumn Festival, falling on the 15th day of the eighth month according to the Chinese lunar calendar, it is the second grandest festival in China after the Chinese New Year. It takes its name from the fact that it is al¬ways celebrated in the middle of the autumn season. The ground floor at TappooCity Suva was closed off to host the event, which was well attended by members of the local Chinese community. On the festival day, family members gather to offer sacrifice to the moon, appreciate the bright full moon, eat moon cakes, and ex¬press strong yearnings toward family mem¬bers and friends who live afar. In addition, there are some other customs like lighting lanterns and performance of dragon and lion dances. The unique customs of ethnic minorities are interesting as well, such as “chasing the moon” of Mongolians, and “steal vegetables or fruits” of the Dong people. “It is fitting to honour the contributions of our Chinese-Fijian community – past and present, and to celebrate the prosperity that comes from mutual respect shared between the different ethnic groups that live here,” said Group executive director Remal Tappoo. “It is worth reminding ourselves that our cultural differences are strengths that con¬tribute to the rich and unique experience that is Fiji. 30th August 2018, Sigatoka, FIJI – The Tappoo Group of Companies is proud to announce its appointment as exclusive distributor in Fiji of Kirloskar brand diesel generators and agricultural pump sets. “We’re proud to expand the variety of offerings available to businesses as well as the agricultural sector in Fiji to meet greener, more environmentally- friendly options” said Tappoo Group Chief Executive Officer Mr. Madhu Tappoo. Mr. Bishnu Prakash, Regional Manager South East Asia, was in Fiji recently to finalize the distributorship arrangement with The Tappoo Group. “We are committed to Enriching Lives of the people in Fiji in association with The Tappoo Group” said Mr. Bishnu Prakash on this occasion. Incorporated in 1946, India’s market leader Kirloskar Oil Engines Limited manufactures air-cooled and liquid-cooled diesel engines and generator sets across a wide range of power output from 5kVA to 3000kVA with exports to over 70 countries over most of Middle East, Africa, Southeast Asia and Europe. The company also manufactures engines operating on alternative fuels such as bio-diesel, natural gas, biogas and straight vegetable oil. “Kirloskar Green Genset” is the market leader and the most preferred brand among customers in the power generation and telecom industry globally. In the agriculture market, they fulfil the motive power needs of farmers, who require products in 3 hp to 130 hp in the global Agricultural space. Kirloskar manufactures a variety of quality diesel pump sets and Agricultural engines powering more than 25 applications across five sectors. “Businesses, and the agricultural sector in Fiji will benefit from the reliable performance and fuel efficiency of Kirloskar’ s pump sets, which have been greening the soils of India, Africa, South East Asia, Latin and Central America,” added Mr Tappoo. Bula vinaka, namaste and greetings to you all. Thank you for joining us today on this auspicious occasion. Today, as you know, we remember the founder of the Tappoo Group, my father – Tappoo Kanji. Today, we pay tribute to him for his tireless work, for his vision, humility and his sense of purpose. On this day, which we now recognise as the Tappoo Founder’s Day, we celebrate his legacy. It is a legacy that our mother, the late Ladhiben Tappoo, also played a prominent role in. They showed us that there is no substitute for hard work. Also integral to my father’s legacy was his humility and deep appreciation of Fiji’s diverse cultures. He showed us that we should be accepting of all people; no matter their creed, age, ethnicity, level of education or economic background. One of the ingenious ways my father helped us learn this was to place us in Christian schools in Sigatoka. It was such experiences that fostered our respect for all. To this day, this principle and that of hard work, fairness, integrity and honesty remain the ethos of our family. These timeless values have helped build our family business into the reliable and respected brand it is today. These values and our roots in our homeland Fiji have helped us to steer our family company in this fast-changing world. The family company has come a long way since my father secured a small space where he tinkered and handcrafted the silver trinkets that were then the popular jewellery of the day. 10ft. That’s just about 3 metres by 3 metres. A very small space indeed. But what my father lacked in resources, he made up for in sheer determination, perseverance, passion and hard work. He – inspired – all – of us. Tappoo Kanji was the inspiration that fuelled our family’s vision and journey to success. From that tiny work space, which we generally refer to as the first Tappoo shop, we have made giant leaps. Today, the family business are proud owners and operators of two iconic shopping malls to serve the Fijian people, a state-of-the-art shopping experience at the Nadi International Airport, and it has established itself in a variety of industries. These industries include shopping malls, retailing, wholesaling, manufacturing, exporting, tourism accommodation, travel, fuel and convenience retailing. It is fitting for our family and our company, the Tappoo Group, to pause on this day and pay tribute to a great man. This day – exactly 77 years ago – Tappoo Kanji started the family business. It started with only our mother at his side to help him. Then Bulou joined, and while he was my father’s first employee, he became a member of the family more than anything else. Today though, the number of employees has increased to almost 1700 people. We are very humbled by this. Humbled because our progress means we are able to provide work for many and support the livelihoods of many more. My father would have been most proud of this. The employment of almost 1700 people would have meant more to him than any acquisition or property development. I am certain of this because whenever he learned that we were employing more people – even if it was just one more person – he would become excited and happy. Yes, he had a lot of empathy. And he would always urge us to never forget our responsibility to our employees. Responsibility is integral to our vision, he would remind us. For us, responsibility and profitability are not opposing forces. On the contrary, they are interdependent. We have long believed that for us to prosper – the communities in which we live in must also prosper. That means we have a responsibility to our employees and to the communities we live in. By the same token, in order to maintain long-term responsibility, we must ensure profitability. The two go hand-in-hand. It was thus quite normal for us to embark on charity work. We have long supported and conducted charity work in the communities. In 2006 – about four years before my father passed away- the family launched the Tappoo Foundation. This Foundation has supported numerous charitable causes and projects, and every year is a new round of identifying where we can help. Today the Tappoo Foundation unveils these beneficiaries on the anniversary of the company’s founding. This occasion ties in with the significant achievement the Tappoo Group is very proud to have realised. That achievement was the opening of TappooCity Lautoka. At the official opening of the mall in January, the Tappoo Group committed $150,000 to the Foundation. A total of 30 beneficiaries have been chosen. These include special schools, youth champions, old-age homes, health missions, orphanages, NGOs for the assistance of rural communities, children with cancer, widows, disabled children, survivors of domestic violence, and many others. Two schools special to our history are also included. They are Kavanagasau Sanatan Dharm School and the Sigatoka Methodist College. Kavanagasau was the school which my father attended when he arrived in Fiji 1932. He was only able to study for a very short period of a few months until my grandfather could no longer afford the tuition. Such a fate was not to be ours. Our father ensured this and we were all fortunate to be educated at Sigatoka Methodist School. These schools, for obvious reasons, are special links to our heritage and will always remain so in our Foundation’s sights. Today, each beneficiary will receive $5000 to assist in their work. We believe that whilst our Foundation is providing much-needed support, the real heroes are the members and workers of these initiatives. The Tappoo Foundation understands and believes that all of us can contribute to our vulnerable communities in many different ways – no matter how small. The Government’s enabling welfare policies and initiatives – like free-tuition, free healthcare and medicine and subsidised water and electricity and so forth – should serve as an inspiration for us all. As stakeholders in Fiji’s future, we can all lend a hand. And forging partnerships in such matters are critical to sustaining such efforts. Every contribution counts. As a charitable trust, we understand this and how challenging it is for charitable organisations to make ends meet. We are therefore confident that the Tappoo Foundation’s contribution will go a long way to help you in your service of others and that it will benefit those who genuinely need the assistance. The Foundation would like to sincerely commend the work of these 30 recipients. Your work to empower our people safeguards our present – as well as our future. Your selfless service and heightened awareness of others’ needs cannot be repaid. Your daily demonstrations of sacrifice and hard work are invaluable. Thank you for your humility. Thank you for the unity you sow. And we thank you for your humanity. With these few words, I would like to close by wishing you all the very best in your efforts to serve the less fortunate. Thank you, Vinaka Vakalevuand Dhanyavaad. The Tappoo family charitable trust, Tappoo Foundation yesterday donated $150,000 to commemorate its founder’s humble beginnings 77 years ago. At least 30 chosen beneficiaries each received $5000 to continue empowering and safeguarding the Fijian people. Foundation chairman Kanti Tappoo officiated at the event yesterday showing unity for a good cause at the Sai Hall in Sigatoka. “The Foundation would like to sincerely commend the work of these 30 recipients. “Your work to empower our people safeguards our present – as well as our future. “Your selfless service and heightened awareness of others’ needs cannot be repaid. Your daily demonstrations of sacrifice and hard work are invaluable. Thank you for the work that you do. Thank you for your humility. “Thank you for the unity you sow and we thank you for your humanity, and the very best in your efforts to serve the less fortunate,” Mr Tappoo said. The Foundation was established by the family in 2006, four years before the passing of the founder, the late Tappoo Kanji. At the official opening of Lautoka’s TappooCity Mall in January, the Group had committed $150,000 to the Foundation. All 30 beneficiaries were grateful to the Foundation for having faith in their work and contribution to those vulnerable in the communities. A beneficiary, the Sigatoka Hospital Board of Visitors, acknowledged the generous contribution by the Tappoo Foundation in their areas of need. Board trustee, Coral Kennedy said the Foundation showed the spirit of care and concern for those vulnerable in the communities. “It is the sign where Fiji is today, the way forward. There is unity amongst other people today and this is clearly shown whether it be for active people or those with a disability,” she said. Another fund recipient from Cakaudrove in Vanua Levu, the Mission at Navutu Creek which was established 10 years ago, vowed to continue their projects that assist the poor to get better medical services, and promotes spiritual growth through teaching and counselling. Mission’s managing director Dr Denis Kalbermatter said: “We received a call to come and receive something.